The DRV5011-5012EVM facilitates evaluation of the DRV5012 and DRV5011 Hall effect sensors. The DRV5012 is an ultra-low-power digital-latch Hall effect sensor with a pin-selectable sampling rate. 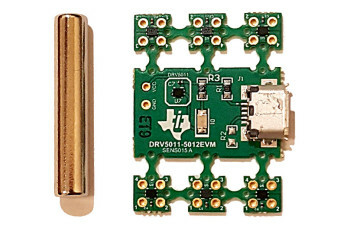 The DRV5011 is an ultra-low-power digital-latch Hall effect sensor. These sensors change their output states as magnets reverse polarity or magnetic fields reach certain thresholds to trigger the sensor logic.